It is both obvious and proven that students who are engaged in their studies achieve higher grades and learn more deeply. Recognizing the importance of engagement,  educators have for years addressed this challenge through task oriented learning, collaborative approaches to classwork, and other teaching strategies. It could be argued that technology (in its broadest sense) has always been a primary driver of engagement as instructional materials evolved from text to images to video (all passive), and more recently to computer-based interactives. But in the same way that text is ‘weak’ passive, so are interactives ‘weak’ active. Watching an animation and then clicking on an answer or dragging something from A to B may technically be ‘interactive’—and it may very well be more engaging than reading three paragraphs of text—but it’s nowhere near immersive. Games are. The importance of physical engagement is often overlooked, but important: When constant physical interaction is required (i.e., eye-hand coordination is critical), the game demands the undivided attention of the player (in most games, looking away for only a moment results in disaster). Feedback is also crucial. Although there are assessment tools available that provide real-time feedback in the sense that tests can be instantaneously scored, games provide “continuous feedback” (visual and otherwise), as opposed to discrete, intermittent feedback typical of most assessments. Finally, games—by definition—are a form of competition, where winning has meaning and rewards. 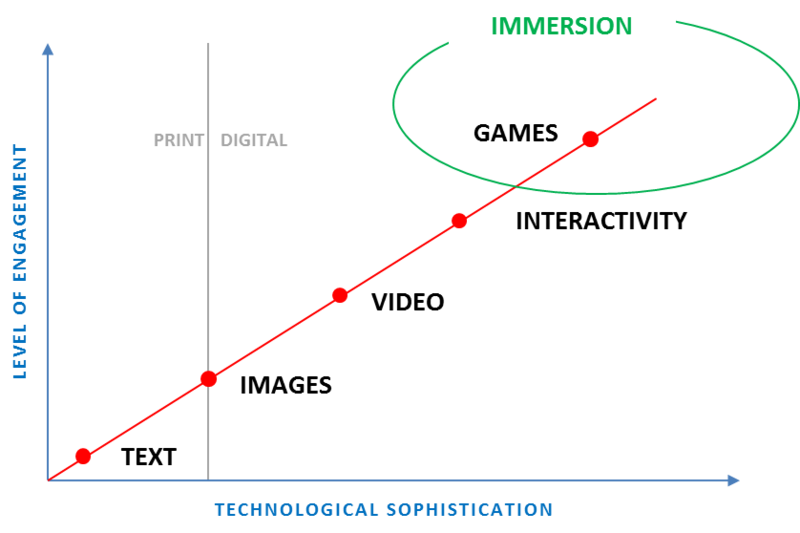 Indeed, the overall effect of a true game is “immersion.” The player is not interacting with the game, he/she is “in the game.” It is only when this state is achieved that real engagement is achieved. The challenge then, from an instructional standpoint, is to re-cast educational concepts in the form of games whereby winning (or at least playing) results in learning. That’s what Digital Glass is all about. 1 Newman, F., ed. (1992). Student Engagement and Achievement in American Secondary Schools. Teachers College, Columbia University. See also: Instructional Discourse, Student Engagement, and Literature Achievement, Nystrand, M., and Gamoran, A., Research in the Teaching of English, Vol. 25, No. 3 (Oct., 1991); and Student Engagement and its Relation to Quality Work Design: A Review of the Literature, Bowen, E., (2003). 2 The term “engagement” has a definition. See Schlechty, P. (1994). Increasing Student Engagement. Missouri Leadership Academy. Schlecty defines engagement as: interest in the work, willingness to persist despite challenges and obstacles, and delight in accomplishment. 3 In his 2010 TED presentation, game theorist Tom Chatfield listed seven aspects of video games that engaged the player, including feedback, the need to multi-task, uncertainty, etc. See Tom Chatfield: 7 Ways Games Reward the Brain. 4 Boys tend to play computer games more than girls, but research shows that girls also enjoy games—just not the games targeted at boys. In an educational setting, however, content can be gender-neutral (i.e., curriculum-based), and incorporate features more likely to appeal to girls. See: Girls and Gaming: A Summary of the Research with Implications for Practice, Denise Dagosto, 2004. 5 Although games are, in effect, a form of “assessment,” they differ in this important aspect.